Back to the Future Part II is a 1989 American science fiction comedy directed by Robert Zemeckis and written by Bob Gale. It’s the sequel to the 1985 film Back to the Future and the second part in the Back to the Futuretrilogy. The film stars Michael J. Fox as Marty Mc Fly and Christopher Lloyd as Dr Emmett “Doc” Brown. In this film, Marty and his friend Dr Emmett travel forward in time to 2015 to prevent McFly’s future son from ending up in prison. In this scene, Marty is in the garage when his girlfriend, Jennifer, turns up. 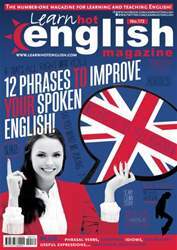 The latest issue of Hot English (172 – the September issue) is out now! Learn over 300 useful words and expressions and improve your listening skills with Learn Hot English! This month: 12 phrases to improve your speaking skills, 12 prepositions of movement, 8 “crime” idioms, 7 phrasal verbs for talking about pets, 10 words for talking about the environment, 20 words and expressions for talking about baseball... plus: • Grammar – modal verbs • World culture – coffee or tea? • Humour – toilet stories • Communication – how to talk in sound bites • Technology – robotics • Travel – travel apps • Food – onion rings • Work – annoying office habits • US culture – Saturday Night Live • Conversation – how to take turns in English • Cooperation – how to brainstorm • Horror – spooky clown story • News – photos in the news • Music – Michael Jackson. AND LOTS, LOTS MORE! By reading and listening to all this great content, you'll improve your English reading and listening skills and learn up to 300 useful words or expressions. Plus, you'll get a better job and pass English-language exams more easily. Guaranteed! WHAT WILL IT BE: COFFEE OR TEA? HOW SOUND BITES CAN IMPROVE YOUR SPOKEN ENGLISH! WHY TEACHING ROBOTICS IS A GREAT IDEA! REALLY ANNOYING THINGS IN THE OFFICE! How to end a meeting! 12 PHRASES TO IMPROVE YOUR SPOKEN ENGLISH! FIVE GREAT APPS FOR TRAVELLING ABROAD! TWO BOOKS TO HELP YOU BE GREAT! FIVE REALLY BAD TEAM BUILDING EXERCISES! WHEN A PHOTO IS THE NEWS!